Hi!, My name is Madhur Behl. I am an Assistant Professor in the departments of Computer Science, and Systems and Information Engineering, and a member of Link Lab at the University of Virginia. Before joining UVA, I was a research fellow at Penn and the Co-Founder of Expresso Logic - a NSF SBIR small business building a demand-response recommendation system. I received my Ph.D. (2015) and M.S. (2012), in Electrical and Systems Engineering, both from the University of Pennsylvania. I recieved my bachelor's degree (2009) in Electronics and Communications Engineering from PEC University of Technology in India. I am actively recruiting PhD students with a background in machine learning, control systems, optimization, and embedded systems. Opportunites exist to conduct high impact and cross-disciplinary research in Cyber-Physical Systems. My research develops the foundations of Cyber-Physical Systems (CPS). This involves finding analytical and practical solutions to problems of modeling, control, simulation, operation, safety, and implementation of CPS. In particular, I’m interested in challenging probelms which involve the use of data-driven methods for CPS. This work is at the confluence of machine learning and predictive control systems. Applications of my work span from energy-efficient buildings, demand response, and smart cities; to control for autonomous systems, and safety of self driving cars. Bridging the gap between machine learning and predicitve control synthesis. Build, drive, and race 1/10 scale autonomus cars at the limits of control. Answering open-eneded queries using procedural generation and interpretable models. Uncertainity propagation from sensor placement to data quality to modeling to control. A scalable and lightweight scheduling approach for peak power reduction in buildings. An energy router for peak power reduction in buildings. Controlling DICOM (medical imaging) viewers with hand gestures. ASME (The American Society of Mechanical Engineers) write-up on - 'Lack of engineers a roadblock to future of AVs' featuring our F1/10 course. Congratualtions to Shrirag Kodoor, and Dipshil Agrawal for graduating from the CS masters program! Shrirag worked on Fly-by-pixels and will joining Facebook, and Dipshil worked on DeepRacing and will joining the Walmart AI group. Gave an invited talk on “DeepRacing: Teaching Autonomous Vehicles to Handle Edge Cases in Traffic" at the 2018 Datapalooza 2018 at the UVA Data Science Institute. Serving on the program committee for the 10th ACM/IEEE International Conference on Cyber-Physical Systems (ICCPS) which will be held as part of CPS Week 2019 to be held in Montreal, Canada, from April 16 to 18, 2019. Gave an invited talk on "DeepRacing AI - Teaching autonomous vehicles to handle edge cases in traffic" at the 2018 International Workshop on Next Generation Cyber-Pysical Systems (Next Gen CPS) . We gratefully acknowledge the support of NVIDIA Corporation with the donation of the Titan Xp GPU used for the DeepRacing research. 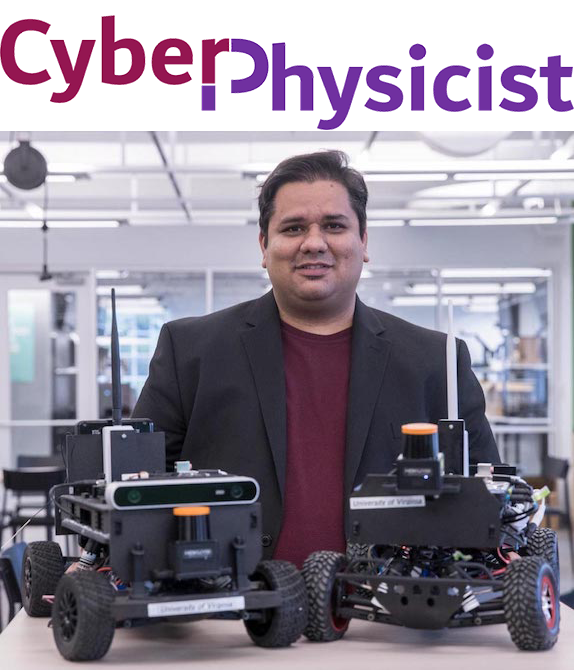 I will be teaching the special topics graduate level course on Principles of Modeling for Cyber-Physical Systems in Fall 2018 [Course website] This course will also be taught online as part of UVA's CGEP program. Received UVA Research Innovation Seed Award for - Foundations of Automated Risk Assesment for Cyber-Physical Systems. I am the co-chair for the HIL-IOT 2018 International workshop on Human In the Loop Internet of Things, co-located with IOT 2018. Consider submitting your best work. Invited to speak at Mid-Atlantic Data Driven Safety Analysis Peer Exchange. Research paper with Jeff Sadler, and Jon Goodall on Data Predicitve Control for Stormwater Infrastructure Management accepted to appear at the 11th International Conference on Urban Drainage Modelling. I am the general chair for the SCOPE 2018 smart cities workshop at CPS Week. Consider submitting your best work. I gave the F1/10 Autonomous Racing tutorials at SenSys 2017, Delft, Netherlands. Served as the posters and demos chair at BuildSys 2017, Delft, Netherlands. Gave an invited talk on "Data Predictive Control - Bridging Machine and Control in Cyber-Physical Systems" at the 2017 Chesapeake Large-Scale Analytics Conference (CLSAC) . This year's theme was predictive analytics. I am organizing an invited session on Building Energy Systems at the 2018 American Control Conference. For Fall 2017, I will be teaching a new graduate level special topics course on Prinicples of Modeling for Cyber-Physical Systems. Attended NSF's New Computer Science Faculty Teaching Workshop held at UC San Diego[Link]. Many thanks to Cynthia Lee, Beth Simon, Leo Porter, and Mark Guzdial. My chapter on Data-Driven Modeling, Control, and Tools for Smart Cities has been published in the Smart Cities: Foundations and Pricniples book. Out paper on Data predictive control for building energy consumtpion won the Best Energy Systems Paper Award at the American Control Conference 2017, held in Seattle. I am serving as the poster and demo chair for BuildSys this year. My startup Expresso Logic, has been awarded the Phase 1 NSF Small Business Innovative Research (SBIR) award.